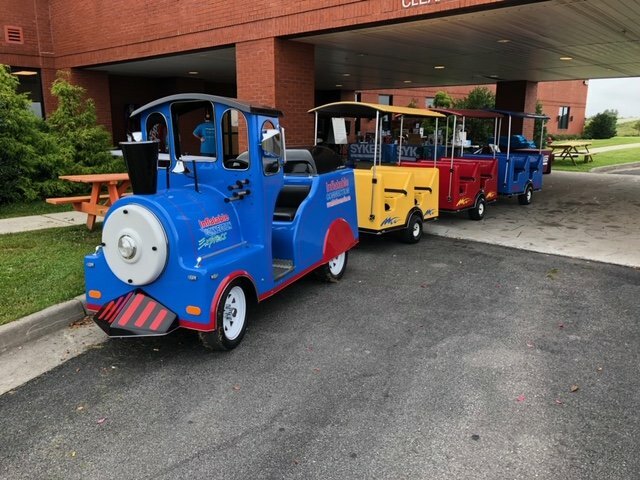 A Trackless Train Rental is a great way to make any party or event one to remember forever. Our BRAND NEW Bouncing Buddies ExpressTrackless Train has been set up with a custom color scheme. It also comes equipped with a sound system, PA system, LED lighting and last but not least the traditional train horn. With all these features it will be sure to catch the eye of everyone around. Our trackless train is unique compared to most not just for the cool features already listed, but for its electric drive train system. It can be used outdoors as well as indoors and on concrete or in grass. Since the power source is electric it has no exaust smell and not to mention no noise for a more enjoyable ride. Our trackless train rental can fit up to 18 children or 12 adults. It is also possible to mix a combination in between children and adults. We can come to your residential party for a couple of hours or run all day long at a city event. Bouncing Buddies is located in Lafayette, La and serves all the surrounding areas including: Broussard, Youngsville, Carencro, Duson, Abbeville, Crowley and many more for their party rental needs! Travel fees may apply to some areas. We pride ourselves in providing clean inflatables, affordable prices and great customer service! Bouncing Buddies Inc. is also fully insured for a safe worry-free bounce house rental experience! Call us at 337-456-8600 or Click Here to reserve your bounce house today!